Page McKenney (#3) edged out three rivals to win the John B. Campbell Handicap. His rise to stardom was one of the big stories of ’15.Photo by Laurie Asseo. 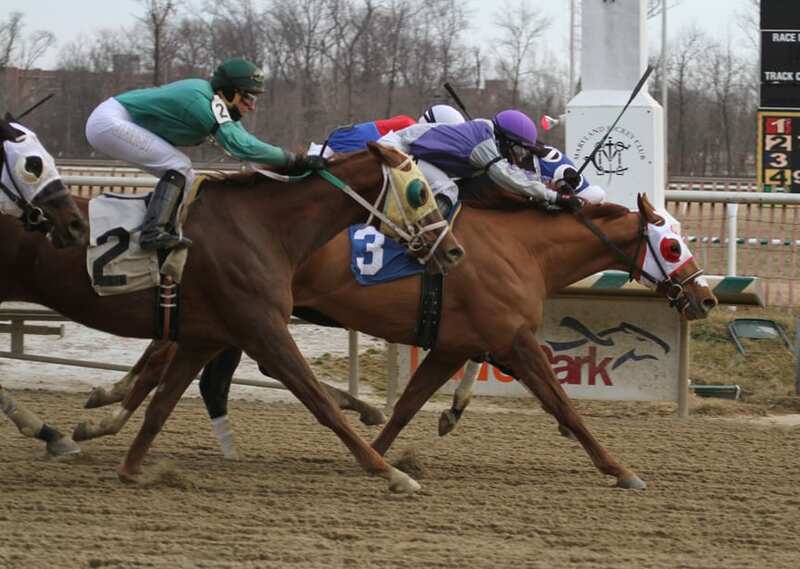 Laurel Park’s Saturday afternoon program will be highlighted by three $75,000 stakes featuring popular older horses Page McKenney, Primo Via and Eddy Gourmet. First race post time is 12:25 p.m. In the $75,000 Native Dancer for 4-year-olds and up going 1 1/16 mile, Adams Staple’s and Jalin Stable’s Page McKenney is expected to be the favorite. The 6-year-old, trained by Mary Eppler, comes into the Native Dancer off consecutive victories in Laurel’s Richard Small Nov. 14 and the Swatara at Penn National Nov. 25. Page McKenney recently earned laurels as the third-rated horse in the Mid-Atlantic Thoroughbred/The Racing Biz Top Midlantic-bred Poll for 2015. The gelded son of Eavesdropper placed in all 10 of his races last year and won five stakes races. Page McKenney also finished second in the Pimlico Special (G3) and third in the Charles Town Classic (G2) and Cornhusker Handicap (G3). His opposition in the Native Dancer includes Catron, a Todd Pletcher-trained horse who finished third in the Swatara and Indycott, fourth in the $200,000 Claiming Crown Jewel at Gulfstream Park Dec. 5. Eppler will saddle another veteran campaigner in the six-furlong What A Summer Stakes for fillies and mares in Eddy Gourmet, who was claimed last time out by Triple Tree Stable. Eddy Gourmet, a 6-year-old daughter of Eddington, has won three of seven starts at Laurel and earlier this year won the Conniver Stakes. E Dubai’s Humor, a winner last time out and three for four at Laurel, will likely be favored. In the Nellie Morse at 1 1/16 miles for fillies and mares, Primo Via will likely garner support. A winner of her only start at Laurel, Primo Via comes into the Nellie Morse off a fifth-place finish in the Claiming Crown’s Glass Slipper over a sealed, good track at Gulfstream. The 7-year-old mare, based at Parx for trainer Phil Aristone, has earned nearly $500,000 with 13 wins in 58 starts and is multiple-stakes placed.